Right here you can get the inside scoop on your favorite copycat recipes from restaurants. With this collection of 19 Newly Uncovered Copycat Recipes, you can impress your friends and family with their favorite restaurant meals by making them right in your own kitchen! Save that money you would have spent eating out for something else; these frugal copycat restaurant recipes will allow you to dine in style without breaking the bank! For even more mouth-watering copycat recipes, check out our 27 Secret Restaurant Copycat Recipes free eCookbook. As a special added bonus, in this collection of our best copycat recipes we've included not one but five Applebee's restaurant copycat recipes! 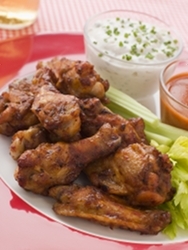 Start with Applebee's fantastic Chicken Wing recipe, and read on for even more great ideas. You'll never want to sit in a crowded restaurant again with these copycat recipes from restaurants. 1. Cook the wings by baking or deep-frying. 2. Mix all sauce ingredients except flour in a saucepan on the stove. Cook over low-medium heat. When warm, add flour to thicken sauce. Stir frequently. 3. When sauce is thick, cover bottom of 9 x 13-inch baking dish with sauce. Mix remaining sauce with wings and place in baking dish. Bake at 300 degrees F for about 20 minutes or until warm. Here are some even more great top-secret copycat recipes. Try them all and find a new favorite! 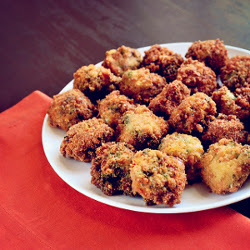 Bennigan's Copycat Broccoli Bites (shown above) - Cheesy and loaded with flavor, you'll be popping these in your mouth one by one. Bennigan's Copycat Broccoli Bites are loaded with cheese, broccoli, and bacon! It doesn't get much better than that. Cracker Barrel Copycat Grilled Chicken Tenderloin - We've seen the love, everyone can't get enough of Cracker Barrel copycat recipes. We've got another amazing one to check out, this Cracker Barrel Copycat Grilled Chicken Tenderloin is delicious. Much like eating out, but at home. Ruby Tuesday Chicken Quesadilla - Ruby Tuesday features some of the best food around. Use copycat restaurant recipes like this recipe to make the best food around right in your own kitchen. Ruby Tuesday copycat recipes show you how to make delicious recipes. Taco Bell Cinnamon Twists - This drive-thru delight is simply delicious. The secret to this great recipe is sour cream. Red Lobster Crab Alfredo (shown above) - Copycat recipes don't get much better. You'll be salivating from just smelling this awesome dish. T.G.I. Friday's Original Jack Daniel's Sauce (shown above) - This is one of the most recognized, sought-after items on the menu. Olive Garden Sicilian Scampi Copycat - It's a classic dish is light and perfect for dinner. Cracker Barrel Old Country Store Hash Browns (shown above) - You'll love this home-style comfort food. Chili's Black Bean Soup (shown above) - This is a fantastic appetizer option during the winter months. California Pizza Kitchen Copycat Pizza Dough (shown above) - Get creative with toppings when you make this copycat recipe. Wendy's Frosty (shown above) - Who doesn't love this famous fast food staple? Steak 'n Shake Chili - This copycat recipe is savory and filing. Starbucks Frappuccino Copycat Recipe - It doesn't get more simple than this iconic drink. Red Lobster Cheddar Bay Biscuits (shown above) - You'll fall in love with these soft, fluffy biscuits. Panda Express-style Orange Chicken (shown above) - Sweet and moist, this chicken is perfect for lunch or dinner. Hooters Fried Pickles - A delicious copycat recipe. Knockout Bloomin' Onion Copycat (shown above) - This delectable appetizer recipe is fried until it's golden brown and crispy. Dipped in a zesty, tangy sauce, it's obvious why it became famous. Tear off a slice and start dippin'. Cinnabon's Cinnamon Rolls - Everyone will love this mall favorite. Applebee's Vegetable Pizza with Spinach-Artichoke Sauce (shown above) - This copycat recipe is great for a family meal. Applebee's Bourbon Steak (shown above) - Break out the bourbon and brown sugar for the delicious meal. Applebee's Classic Patty Melt (shown above) - Two cheese and a variety of spices make this one delicious dish. THIS IS THE BEST SITE THERE IS TO GET RECIPES.........AND ALL THE FREE E-BOOKS THANKS !!! I had a lunch at Cracker Barrel , that was a special. It was Campfire Pot roast. The best pot roast I ever tasted. Would any one have the recipe? The lady that waited on us said it was made in the oven, in a foil bag. Thank you for any help. I just love your site. Everything is excellent. The restaruant food is very good, but I just can't afford it. Now with your help, I can do this at home and enjoy it with my family just as much as going to the restaurant.. Thank you soo much. Is it possible to get some Canadian Copycat recipes from some of the Canadian Restaurants? I have tried to print a number of recipes recently and get all but the first page. Never had this happen before. Am I doing something wrong? Every time I try to print a recipe, Pork Cope e book comes up. What is going on. It didn't use to do this. Does anyone have the recipe for Ruby Tuesdays Pretzel Rolls? Delicious!! chrisjacobsrealtor 0420712 I have that recipe for the KFC Chicken. KFC Original Fried Chicken 2-3 pounds cut-up chicken pieces 1 Quart Water 3 tablespoons Salt (for soaking) 1 cup milk 1 egg, beaten 2 cups flour 1 teaspoon Accent (MSG) 1 tablespoon salt 1 teaspoon black pepper Soybean Oil (no substitutions) for frying Allow chicken to soak in salted water for a half hour. Mix egg and milk in a bowl. Mix flour, Accent, salt, and pepper in another bowl. Preheat deep fryer to 350F, or place 3/4 inch oil in a skillet set on medium. Dry chicken with paper towels. Dredge in flour mixture, place in milk/eggs, and then back to flour mixture. Do this one piece at a time making sure that there is total coverage over entire surface of chicken in each step. KFC uses pressure cookers to fry chicken, which is risky to do at home. If you are using a deep fryer, fry a few pieces at a time for about 20 minutes, covered, turning occasionally. Likewise, if pan frying, cook, covered, turning occasionally for about 30 minutes. As always with chicken, check the middle of a large piece to check for doneness. Allow to drain on paper towels when cooking is completed.